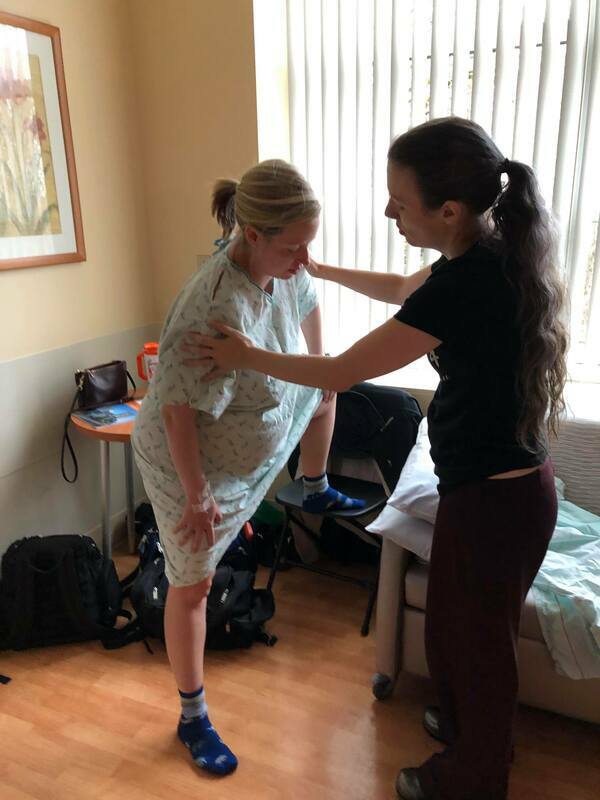 After we learned Katie's baby was asynclictic, I helped her do a variety of poses and exercises to encourage baby to straighten out and help labor progress. Suzanne was our doula for the birth of our first child in 2015. She was with us for about 30 hours ... at our home for early stop and start labor and at the hospital overnight and until after our son was born the next afternoon. She was incredibly helpful in preventing us from going to the hospital too early and also helping us find a balance between trying to rest during early labor and trying to get things moving faster. At the hospital, she helped us navigate several interventions. Ultimately, I ended up asking for an epidural so I could rest before delivery. I never felt like she thought that was the wrong decision or that I was giving up ... she was supportive and continued to coach us through delivery and breastfeeding. She was always available and responsive when I texted her, even when semi consistent contractions started in the middle of the night. She was able to give us guidance on when to go to the hospital based simply on my text message updates on contractions and how I was coping. I was 4.5 cm dilated when we did get to the hospital and was admitted. She knew which positions would help baby straighten out when we learned she was not in the optimal position for delivery. She brought a TENS unit and when she realized she didn’t have pads for it, she contacted her doula network and someone was able to drop some off at the hospital. The TENS unit was quite helpful for me as a coping technique and I ended up using it clear through pushing. She advocated for my use of the hospital’s single nitrous oxide machine. I had to wait for a couple other women to be finished with it first, but Suzanne continued to inquire about its availability and it was brought to me to use at the perfect point in my labor. She coached my husband on applying counter pressure and allowed him to take breaks as needed. She suggested new positions and switched things up to keep my mind off the pain and keep things moving. She rolled with my emotional moments and kept me thinking positively about the progress I was making. I will always remember the point in my labor when I was struggling emotionally with the pain and she told me to look behind me...I saw that the nurses were setting up the baby station for delivery and Suzanne said they believed in me. It was exactly what I needed to see and hear at that particular moment. She coached me through pushing and essentially reminded me to push as I was still focused on vocalizing through the pain at first. Suzanne and the nurses and doctors all seemed to worked together very well and I saw nothing but mutual respect from the whole team. As a result, my husband was able to focus on supporting me emotionally. It was a very special birth. And Suzanne captured so many amazing photos throughout ... I loved being able to relive the experience through the pictures. Suzanne was also very helpful in answering some breastfeeding questions in the days following. She confirmed things were going well during our postpartum appointment and reminded us we could reach out at any time. I highly recommend hiring a doula for your birth, and specifically, Suzanne! I write this through tears of joy as I reflect and look at the amazing pictures Suzanne took. My labor & birth experience was incredible, difficult, and beautiful all at once and it wouldn't have been the same without Suzanne, our doula. Suzanne kept me focused and calm while I labored at home. Her expertise and encouragement helped me choose the perfect time to go to the hospital. Our goal was to arrive at 6cm and we were dead on. By 2 am exhaustion got the better of me and I emphatically demanded an epidural. Suzanne encouraged me to stick to my birth plan and try the nitrous first, but at only 9cm by 3am I was done. ​Two hours of sleepless rest and 3 hours of pushing (the epi had pretty much worn off by then, so I felt everything!) She made me feel supported and not judged. My son was born at 10 am and Suzanne was with us the whole time. I wouldn't give birth again without her. After the initial excitement of the news of our pregnancy gave way to the anxiety of actually giving birth, I began to put together a plan to give myself and our baby the best start possible. I knew immediately that I needed a team who supported me in my decisions and birthing goals. My first birth was arduous; a 44 hour labor with a medical team who at every minor hiccup panicked like a herd of gazelles, framing their "interventions" as medically necessary and leaving us to feel vulnerable and scared. My husband kept telling me how he felt so helpless. Our search led us to finding Suzanne and after meeting her, I knew she was confident, knowledgeable and would be integral in helping me accomplish the natural, calm birth I imagined. The time from my first contraction to our baby’s birth was less than 3 hours, but Suzanne arrived as soon as we needed her. The intensity of the contractions were hard and fast with little to no break in between. Suzanne was there; providing counter pressure, providing gentle reminders and a supportive touch. She never took space from my husband, but jumped in when needed, softly reminding of my goals and giving me the skills to achieve them. In short, I want to tell you to stop reading and just hire her. She really takes the time to listen and understand the birth you are trying to achieve. Even when met with a new plan, she was there, explaining the pros and cons, helping guide me to my own decisions, reminding me of my wants and how to use my strength to advocate for myself. One of the greatest moments was when I thought for sure I had hit my limit and yelled out “I can’t do this!”, and she simply said back “You ARE doing this!” She is there for you, your partner, and the new beginning you are about to embark on. You will not regret having Suzanne as a member of your birthing team. She is truly spectacular. 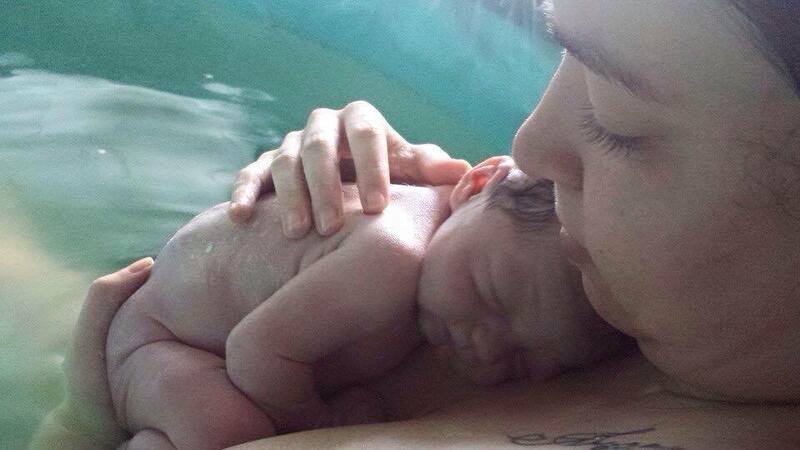 Having a doula present for the birth of my son was something important to me. After learning the value of a doula with my daughter, I knew that if I wanted things to go smoothly this time around, we needed a third team member. Suzanne was the perfect addition to our birth team. I was hoping for a VBAC, as my daughter’s emergency c-section was traumatic, and Suzanne was supportive of that dream. When I started looking for a doula, several were recommended by close friends, and a couple by casual acquaintances. Suzanne was suggested by a woman I barely knew, but meeting with her was like reconnecting with an old friend I hadn’t seen in a few years. We clicked, she understood me, and I was hooked. She had to be part of my birth team. During our meetings she was professional, but also confident, and kind, and she never made me feel as though my questions and concerns were not valid. She supported my vision, and asked me the hard questions that I didn’t always want to answer. What if I can’t have a VBAC? What if things don’t go according to my birth plan? What is most important, and what can I let go of? I hadn’t even considered the possibility of things not going the way I wanted, so her gentle reality check was just what I needed. The first time I thought I was in labor, Suzanne was with us for the entirety. She came to my home, then followed us to the hospital. She walked with me, held my hand, and was there when the doctor told me I would not be leaving with a baby, and I wasn’t in labor yet. I was sent home, and I was more than a little bit heartbroken. Suzanne kept in constant contact, and made sure I was doing alright emotionally. Her support was crucial, and my partner and I were able to get some rest, reset our expectations, and wait it out for another week. The next weekend, Suzanne came to the hospital and helped me through the worst pain I have ever experienced, supported myself and my partner through some difficult decisions, reminded me of the things I had told her were most important during our visits, and held my hand while I made the decision to switch from a VBAC to a gentle/family centered cesarean. She took beautiful photos of the delivery, stayed to make sure my partner and I were settled, and checked in on us regularly throughout the rest of our hospital stay. She made us feel like we were the only people who mattered throughout it all, and helped us change our vision of birth in just a few minutes. Without her, I believe that the experience would have been completely different. I was scared, but she was calm. I was unsure, but she was confident. She lent me her strength and wisdom, and I truly believe she saved my birth experience. 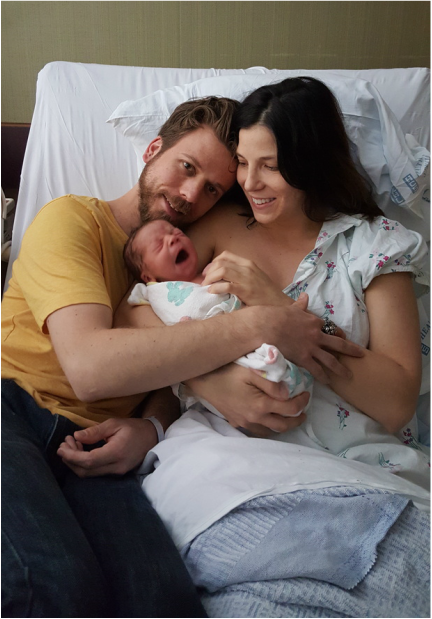 My partner and I agree that her experience, caring nature, and confidence in the process were invaluable while bringing our son into the world. I feel so blessed that she was part of my pregnancy and birth experience, and I hope that I will be able to have her present for the delivery of any future children. When Suzanne says she is waiting with you, rest assured that you are in kind, capable hands. ​This was my second pregnancy and I knew I wanted to have a doula to help me labor this time. My first delivery went really quickly, almost too quickly. The contractions went from mild and manageable to intense and frequent within a half hour. I kept forgetting to breathe and would lose it after every contraction. This time I knew I needed extra help to labor effectively. I found Suzanne through a friend who used her services for her delivery. I was not disappointed. She helped me to have my most perfect delivery. As a healthcare professional, I am very particular about the healthcare I receive, and labor is no exception. I need to know every drug that goes into my body and do not want to be pressured into unnecessary interventions just because of protocol. And since my 2nd baby was measuring small (like my first) and threatening to make her grand arrival early, I knew policy and procedure would be strongly implemented during my labor. Suzanne spent hours discussing every possible scenario that could happen with me and educated me on the "why's" of certain procedures. I felt much more educated and prepared to handle delivery after we discussed my wishes. Delivery day came at the very end of 36 weeks for me. By the time I delivered, my baby girl was 37 weeks right on the dot. I started getting contractions in the evening. At first, I thought they were nothing because I had been contracting for weeks and was already 4cm dilated and 80% effaced. Everything at that point felt like labor but never really turned out to be the real thing. Suzanne kept in touch with me as I labored at home and helped me monitor my contractions. They never quite organized into the pretty "5 minute apart lasting 1 minute or longer " scheme. They were about 9 minutes apart when I told Suzanne I wanted to go to the hospital. I just knew it was time to go. I don't think I would have known when to go if I hadn't discussed all of this with Suzanne in the months before. By the time I got to the hospital I was already about 7-8cm dilated and whisked away to a room. Somehow I got changed, an IV inserted into my arm, and was on my hands and knees laboring on the bed. Suzanne rushed into the room just in time to help me labor and never left my side. I still kept forgetting to breathe before she got there, but it changed when she was with me. She had me focus on her and we breathed together. I know I probably sounded like a crazy woman to everyone in the room because I talk a lot while laboring but I actually felt more empowered with her there. I remember thinking "I can do this!" right before it was time to push. When I was at that stage with my son, I didn't feel the same way. I also was very lucky because the delivery nurse was one of the nurses I knew from when I had my son. And, my doctor was there to deliver my baby girl instead of an on-call doctor. I knew everyone in the room and I felt so comfortable to be myself. The room was quiet and focused which helped me to really focus on Suzanne and my breathing. I knew when it was time to push. And Suzanne reminded me that I know best at what stage I was in. I was able to push my little girl out in almost 2 pushes. It was the most amazing delivery and Suzanne was there to encourage me. She stayed by my side during our first breastfeeding session and until I was completely settled and we were sure the baby didn't have to go to the NICU because of her size. I would highly recommend Suzanne to anyone considering having a doula during delivery. I only wish I had found her earlier for my first delivery. She really helped me to have my most perfect delivery and for that I am so grateful! That moment when you realize you did it! ​When I became pregnant with my second baby the one piece of the birth plan I did not have to research was the doula. Suzanne is one of my oldest friends (we met in the 1st grade), and I knew she was an amazing doula, so she got the job without an interview. I’d used a different doula for my first baby (we were living in New York at the time – out of Suzanne’s range! ), and I have to admit that that experience wasn’t great. But I knew Suzanne was both more knowledgeable and more inclined to provide the hands-on support I wanted. Just knowing Suzanne was on my birth team made me feel 10x more comfortable going into the homebirth I’d planned. My second baby came quickly, and we cut the timing a little close: Suzanne arrived 34 minutes before the baby was born and the midwife arrived with just 6 minutes to spare. Still, that was a crucial 34 minutes, and things might have gone very differently if Suzanne wasn’t there! As soon as she arrived Suzanne immediately jumped in to apply counter pressure (I’d been laboring alone in the attic and doing this all myself!) and got my husband to work filling the tub. She suggested positions to help move the baby past the tight spot in my hips and recognized (even before I did) when my sounds had changed and dilatation was likely complete. Suzanne calmly but effectively communicated the fact that we needed to get downstairs and into the tub and she helped coach me through breathing to help delay pushing until the midwife arrived. I can’t imagine how scary this would have been if I were on my own. I think my husband’s reaction sums it up: “When I opened the front door and saw Suzanne standing there I’d never been happier to see anyone else at that door before!” Thanks, Suzanne; you are both a dear friend and a truly awesome doula. I became interested in placenta encapsulation after experiencing baby blues with my first baby. A friend shared that she felt the placenta pills greatly helped her mood postpartum. So when I became pregnant again, I thought it was well worth pursuing. Suzanne took the placenta after my baby's birth, and delivered the pills a few days after the birth of my daughter, perfectly packaged. So I never had to "deal" with the actual placenta, which was a plus for me! They looked just like any other sort of vitamin/supplement that you would take in capsule form. I am now 2 months postpartum, and definitely feel that the placenta pills have helped me to have a smoother time emotionally than with my last birth. I notice that they help not only my mood, but also my energy level. If I forget to take them, I definitely notice a difference. I never thought I would be a placenta encapsulation person. Or a home/water birth person. So never say never! If I ever have another baby, I will most definitely be calling Suzanne and doing this again! When I found out I was expecting my third child I knew I wanted Suzanne to be my birth doula again. She was with my for my second child, Zachary, born 8/24/11 and I was her first client. I had a VBAC just 14 months after my daughter's birth and I was really anxious. I had prodromal labor with him for the last 3 weeks of my pregnancy and Suzanne was the one who educated me on what I was experiencing and spent a lot of time with me on the phone, talking me through it. For my third pregnancy, I knew that I was capable of having a repeat VBAC but I carried a lot of anxiety about her position (posterior, brow presentation, etc) and whether or not I would be successful again. Suzanne shared some great advice about positions to be in during my third trimester to help encourage baby to be in a prime birthing position. And when my prodromal labor started around 2 months before her due date, I already knew what was happening and I was better prepared to handle it with minimal frustration. For months, I said my daughter would be born on Sunday, July 31st and it actually happened! I went into labor at midnight and did the tests Suzanne taught me (changing positions, moving around) to make sure I was really in labor since I was 5 days before my EDD. When my water broke at 1:30, I called Suzanne and she met us at the hospital. She, my husband and the labor nurses were such an amazing, supportive team. She helped me get into my best position for this labor which was standing up. She praised me for my hard work and said nothing but encouraging words, to the point in which I was saying them too aloud. My daughter, Elsie Mae was born at 4:36 am, just 1.5 hours after getting to the hospital and while it seemed like forever in the moment, it was so fast now that I look back on it. When it came time to cut the cord, my husband and I suggested Suzanne do it, which was her first time! And then she shared the news with me, that July 31 was her 5th anniversary of becoming a doula! I couldn't think of a better way to celebrate!! 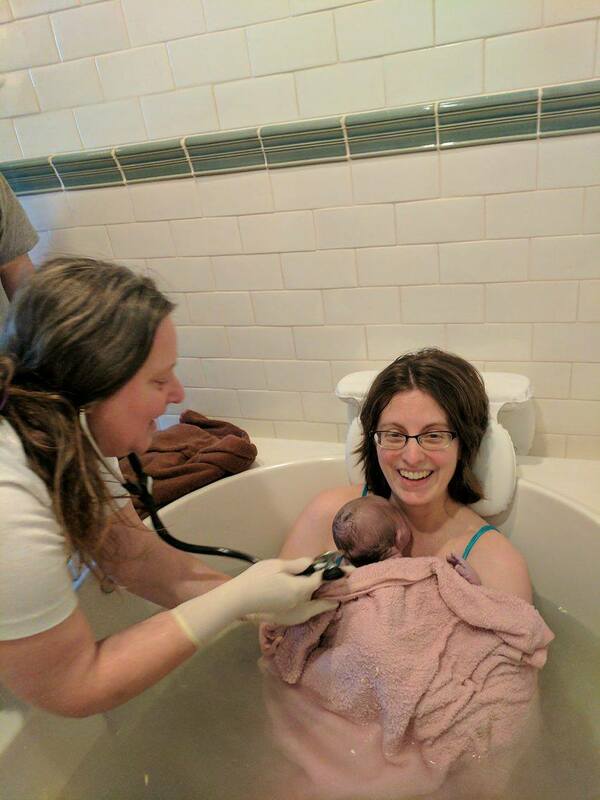 When I found out I was pregnant I knew immediately that I wanted a drug free home water birth. One of the next questions was about a doula. What the heck is a doula? I really had no idea until I went into labor. My doula Suzanne was there to help me emotionally and mentally while the midwife was there to make sure Axel and I stayed alive. She reminded me to eat, hold my hand, told me to "roar" (LOL) and helped keep me calm. My family helped too but it wasn't the same, they weren't trained for it like she is. Suzanne, thank you so much for all that you do. You are an amazing doula and my birth would not have been the same without you! I sat down to write a testimonial about our birth experience with Suzanne as our doula, but I find myself at a loss for words. Like how you can’t really describe an amazing sunset, or a feeling you have deep down in your heart. A husband’s perspective of the birthing process can easily be found in anecdotal online articles lined with advertisements and top 10 lists, but a woman’s perspective of the birthing process is entirely unique for each mother. Natural childbirth is a frightening concept to most men. When Marissa decided to have a natural childbirth, I instantly became concerned about how I would be able to handle seeing her in such pain. We started researching doulas and found Suzanne’s website. After our initial appointment we knew we didn’t need to interview anyone else. Suzanne’s knowledge and experience were apparent from the very first meeting, and were enough to put our minds at ease. We had a couple of prenatal visits with Suzanne where we were able to ask some questions and go over our birth plan. With some testing about a week after our due date, the midwives recommended that Marissa be induced, so we called Suzanne and packed up for the hospital. What we had originally thought would be a chemical induction progressed naturally and rapidly, with a small amount of physical intervention; something we had spoken with Suzanne about prior to leaving for the hospital. Marissa wanted a drug-free birth, but was willing to change plans for her or the baby’s sake. With Suzanne’s help, Marissa was indeed able to have a drug-free birth experience. Now, that’s not to say Marissa’s birth experience was routine — far from it. baby to her mother’s chest as safely and quickly as possible. Needless to say, this wasn’t exactly how we’d planned, but I wouldn’t change any of it for the world. If it weren’t for Suzanne’s advice and dedication, Marissa would not have had anything close to the birth experience she wanted. Suzanne’s presence alone relieved a great amount of pressure on both of us, and set into motion what would turn out to be an extraordinary birth experience. We have already started to discuss hiring Suzanne for our next birth. The value of Suzanne’s service far outweighs the fee. My husband and I would have truly felt lost through our birth journey without Suzanne's amazing support, presence, and calming (yet rational) influence. I planned to have my son naturally, intervention-free, and at a freestanding Birth Center. He was 9 days past his due date when early labor started, and Suzanne was so quick to respond with advice it blew me away. As the night went on, and contractions normalized and intensified, we left home to head to the hotel (I moved one and a half hours away from the Birth Center). Labor stalled that next day, and she came to the hotel and was up with me that whole next night to cope and to help labor progress. Several hours after my water broke, we were finally ready to head to the Birth Center, and she helped fill the midwives in, and continued to answer my questions. Due to the baby's position, and my exhaustion after 2.5 days of labor that was stalled again, she supported me in transferring to a hospital. We had still planned to proceed with a vaginal birth with the addition of Pitocin. She helped me find positions to manage the contractions as the epidurals kept failing, and to encourage me to push in the best way. He ultimately was stuck on my tail bone, and the attending doctor did not feel comfortable using any instruments to help him come down the birth canal. I was exhausted, disappointed, scared, and overwhelmed when the mention of a C-Section came up. She helped me find the strength to push one last time, knowing that if it works, I'd still have a vaginal birth, and if it didn't work, she let me know that I had left nothing on the table. She helped me never give up, and I know I did everything I could to try to push him out. It turns out that a baby with a head size in the 97th percentile, who was OP and Asynclitic, just couldn't fit through my pelvis. She helped to reassure and calm me as they prepped me for the surgery. 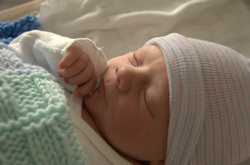 Almost exactly 72 hours after my first noticeable contraction in early labor, baby Troy was born via C-section. She was in the recovery room immediately after, helped me get him to latch and breastfeed, and reaffirmed that I did everything I could to make sure he was delivered safely. Even though nothing went as planned in labor, I honestly still feel that I got a lot of the same experiences as if I had my intended natural birth. I was able to feel his head in my birth canal, I know exactly what contractions feel like all the way through the pushing phase, I felt empowered that my pushing was helping him start his descent down, and I still had the opportunity to hold him almost immediately to instigate successful breast feeding. Without Suzanne's help, we truly would have felt so lost and discouraged, that I don't think I could possibly have viewed my roller coaster labor as positive. I'm blessed to have a healthy 1 week old baby and have no regrets about my role in his delivery. Suzanne - thank you from the bottom of our hearts. Rachel meets her son, Miles, minutes after birth. Suzanne was our doula at the birth of my first child and when we found out we were expecting again I knew instantly that I wanted her present for the birth of our second. Just like for the first birth she brought the correct amount of attention and suggestions when needed. She asked the right question/offered ideas at the right time without being obtrusive. It is so comforting to have her present, even if it's your second birth, and to know everything is normal and that your body is doing it's job like it's designed to do. I'd once again highly recommend Suzanne to be your birth doula. My testimonial is a bit unusual. I don't consider Suzanne my doula because she's family. Originally, I did not plan to have a doula at this birth for several reasons. At my first birth, (in a hospital) I only had my husband and things went great, and also because the doula I would have chosen, Suzanne, was still on maternity leave when I was due. However, that didn't stop me from asking questions if something came up. I know how passionate Suzanne is about birthing and maternity care, so I knew that if I didn't understand something she would have an opinion or factual answer. As I got closer to my estimated due date, I got more nervous about having a my child at a birthing center. I felt like I needed more support, so I asked Suzanne if she would like to attend, not as my doula, but as family. She said if possible, she would love to be there. So we never had an official prenatal meeting, but like I said, she's family, so she already knew most of my feelings about birth and how my pregnancy was going. I ended up having a water birth. While I was holding my husband's hand through contractions, Suzanne was keeping my forehead and the back of my neck cool with a damp washcloth. She also made sure I was well hydrated. I remember her encouraging me and telling me I was doing good through the contractions. I admit that my memories are a bit fuzzy from after I got in the tub until the birth of my second daughter, so I'm not sure of everything she did, but I am glad that Suzanne was there. I decided to work with a doula for my second birth because my husband was not going to be there for the birth. I am so blessed to have found Suzanne. We had 2 prenatal visits where she really listened to me about my first birth, how I was feeling and my birth plan. She is easy going and will let you set the tone for your relationship. She is really knowledgeable, so if you forget to ask your OB/midwife a question, she is a quick resource. She has an arsenal of techniques to assist with comfort, relaxation and focus during labor. And if all else fails, she will let you squeeze her hand as hard as you need to during contractions. She is a voice for your desires when you just can't speak or think. If it wasn't for her, I would have been sent home from the hospital not knowing I was 5 cm dilated. She is your personal cheerleader during pushing but in a soft, close to your ear kind of voice. My biggest fear was finding someone I felt comfortable with and trusted for an experience that is so personal, especially since my husband was not going to be there. Suzanne was an answer to prayer. She will forever be part of a story that I am sure will be told several times and for that I am thankful and truly blessed. I mistakenly gave Suzanne a week post my actual due date which was only discovered at our first real prenatal meeting. Given that I actually delivered a month BEFORE my due date, her flexibility was outstanding. We had planned our birth to happen at the Puget Sound Birthing Center and as I was a ferry commuter (about an hour and a half away) our biggest communication was when to call and when to leave for the ferry or when to call it quits and go to a local hospital if things were progressing too quickly. It was huge to us that she was so accommodating. Turns out, all of that planning was un-needed. At a routine check up at 36 weeks along, my blood pressure ranked a little on the high side, they sent me to the local hospital for an ultrasound (he was measuring a little small) and while that was all normal, my blood pressure continued to climb. Ultimately, I wound up at UW medical center where they were discussing inducing. Initially, they were expecting this to take a couple of days and for progress to be slow and boring. We let Suzanne know of the potential induction, but things progressed much more quickly than they initially anticipated. However, I wasn't feeling anything, occasionally my back would feel a little tight, so I figured I would let her sleep until things got more real. We texted her when a check revealed I was 6 centimeters dilated (some time around 2 a.m., I think) and she made very sure I called her back and left immediately after verifying that I was S-I-X centimeters dilated. I coerced them into holding off on the pitocin until she got there. Things continued to go slowly, so she encouraged us to get some rest, but when things escalated, she was the perfect combination of present, but not overbearing. I would open my eyes after a contraction to a straw and some ice water or a reminder not to clench my face or a gentle suggestion to try a different sound/tone. We had a beautiful in-hospital, but aside from the pitocin, natural birth. We couldn't be happier. This testimonial is months late because every time I think of Suzanne, I'm so overwhelmed with gratitude that I become speechless. We'd given up hope of children after years of disease and disappointed prayers. Then suddenly, without warning, conception on the edge of 40! I think we held our breath for eight months, we were so scared, and so committed. I knew Suzanne was our doula the moment I felt her hands "speak" to my baby. My whole, tense body relaxed and focused at the same time. Each visit with Suzanne was like a spa day for our hearts; she was there for our fears and there for our dreams. We were staggered by her knowledge and the impact of her support on our experience of the pregnancy itself -- the number of little tricks and details she knew about care and comfort that were in none of my two dozen books. My labor *started* with five minute long contractions every five minutes on a late night trip to the bathroom and very shortly thereafter all sense of time, world, and linear thought were gone as I just gave everything I had to staying present in the pain in that dark little room. Four hours later, the wall-pounding of transition finally alerted my husband, and when Suzanne rushed into the apartment 20 short minutes after his call, I was in the most inelegant of positions on the porcelain pedestal and what little mind I had left was total convinced of my complete physical inability to move. I couldn't even make eye contact! Instantly, she leaned in close making a buzzing low moan that gave me greater peace with the pain as soon as I imitated it. In rapid succession, she realized I was pushing; coached me into panting; used Herculean persuasion, humor, and faith to get me moving; helped me dress; grabbed my coat; reoriented my husband away from loading up our marathon preparations for labor and into loading up ME; and then followed our car to the fantastically amazing Puget Sound Birth Center, where we arrived at 2:55 a.m. and our succulent little butter-bodied bundle was born 16 minutes later. Plus she knit us a hat. After being on the fence for a while about whether or not to hire a doula, my fiancé and I finally made the decision to hire one. This was truly a great decision and Suzanne was a great doula. After 24 hours of frustrating, irregular, random, painful and long contractions, we were all very confused. My contractions just were not getting into a pattern. Without Suzanne doing some research and finding out that most likely my baby was positioned a little crooked, who knows how long I would have been laboring for. She suggested different positions to get in, and my baby repositioned himself and my contractions were regular from there on out. Suzanne stayed with us throughout my entire 38 hour labor and we couldn't have done it without her knowledge, support and guidance. We highly recommend her! 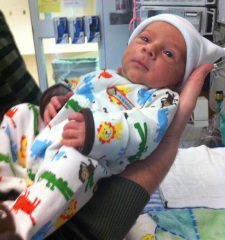 Bekker in his going-home outfit. My name is Kyla and I am only 15 years old. I did not go to any classes or any sort of place for help about labor or childbirth except for Google. Once I only talked on the phone with Suzanne about my situation, it made me feel a lot more confident about what was going on. She then set up an appointment to meet with me and my boyfriend Tony, the father of the baby. At that meeting I didn't know what I was in for, but Suzanne explained everything so well that I understood a little more. I thought she was really great and funny. When I went into labor and she got to my house she knew exactly what to do to make me feel more comfortable. She walked me through everything at the hospital and was right there with me every step. She helped Tony know what to do too, because being 16 he was also clueless. 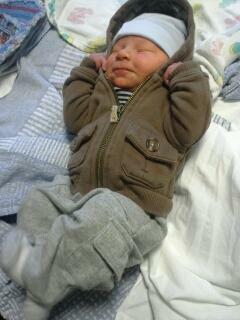 My baby boy was born on 1/27/13 and it was the happiest moment of my life. I chose to give my baby to a family that would better care for him, his name is Bekker. Suzanne took pictures and documented what happened, which I thought was great. I am able to look at her blog and relive all the happiness that Suzanne joined me for. I do not think I would have been able to do it without her, she doesn't know it, but I have thanked God so many times for being so fortunate to have a doula that is so wonderful and understanding. Suzanne was a wonderful part of my birth team, and an invaluable part of helping me meet my goal of a natural, med-free birth! During labor, she comforted me and worked well with my husband and my mother, who did NOT know what to expect. And following the birth, she helped baby latch for the initial breastfeeding, and gave other advice during the postnatal appointment, on everything from cloth diapers to pumping. I would recommend her to any woman going for a natural birth! After browsing doulamatch.net, we selected a few candidate birth doulas to meet. After meeting with two of them, we chose Suzanne to be with us at the birth of our first child. During our initial meeting it was clear that Suzanne was educated and enthusiastic about birth. We felt she would make an excellent addition to our team. We met with Suzanne two more times while I was pregnant, and during that time she listened closely to what my goals were for the birth process (unmedicated with as little intervention as possible). Suzanne did an excellent job of being our advocate and reminding me and my husband of all the things we learned in childbirth class but forgot in the heat of the moment. The birth of our son went exactly as hoped due in large part to Suzanne's presence and support. I highly recommend Suzanne for your next birth! I was 19 when me and my boyfriend found out we were expecting a beautiful baby girl. Around Christmas, me and my boyfriend decided that we wanted Suzanne to be our doula. She was very helpful and caring. She made me feel that giving birth doesn't have to be a scary thing, and she gave me confidence -- something I did not have. As I got closer to my due date, I found out I had gestational diabetes. I told Suzanne and she helped me find information about controlling it with diet so I did not have to use insulin, since she knew I was not a fan of needles. When my doctor said I was going to be induced at 39 weeks, I called her to let her know. Suzanne was with me at the hospital the entire 36 hours from admission to the birth of my baby. I pushed for 4 hours and came close to a c-section, but she reminded me that I could do it. I managed to deliver my daughter with the vacuum just in time. I really couldn't have done it without Suzanne. Suzanne was a great resource through my pregnancy as well as my labor and birth. She is very knowledgeable and passionate about birth which shows in the care and support she provides. I had planned a home birth, which Suzanne and I had talked about in detail, but I went into premature labor at 36 weeks and ended up at the hospital. Despite this and the fact that I didn't have a hospital bag or birth plan written up, Suzanne knew what I wanted in my birth and helped make sure I reached those goals. When I would breathe through my contractions too quickly, she would breathe with me, helping me to slow down and focus on getting through it. She held my hands and provided encouraging words just when I needed them. And when the hospital staff tried to push interventions on me that we had discussed previously, she would remind me that I had options and get the staff to slow down a moment for me to make the decisions instead of letting them dictate towards me. I have no doubt that had I not had Suzanne at my birth, I would not have ended up with the natural VBAC that I ended up with. The support she provided to my family and me was invaluable. I know Suzanne through other friends and she had just completed her studies at Bastyr and was looking for clients to work with to get her certification through DONA. I was on the fence about hiring a doula but after I met her I decided that she was a good fit for me and my husband and hired her. I went through about 3 weeks of false labor and I would call her first and she was so helpful and patient, talking with me and helping me through the anticipation and later frustration. When the real labor hit, she was super responsive and was at my house within the hour. We went to the hospital an hour later and my son was born less than 2 hours later. During my labor at home and at the hospital, she was very supportive and worked well with my husband, which made them a great team for me. She gently reminded me on how to breathe and vocalize more effectively. The birth was fast but I am so glad she was a part of it, she really helped a lot. Her enthusiasm for birth and families is amazing and she is truly genuine. Suzanne was my doula for my homebirth, and having her there made a huge difference. She cheerfully showed up in the middle of the night and was invaluable support all through my labor. In fact, she was invaluable support all through my pregnancy. She answered a million questions and constantly calmed my mom-to-be fears and worries. I know that my labor was as successful as it was because she was there for me. She was also great support for my husband, who was a bit overwhelmed by all the intensity of labor. She knew my birth plan well, and made sure I got what I wanted. For example, my midwife suggested I stay out of the tub in early labor so we didn't slow things down. By the time labor was getting more intense, I had almost forgotten the tub was there, but she reminded me of that option, and her timing was perfect. She also suggested a position change toward the end of labor that made a huge difference. I was getting worn out pushing, and I really appreciated her judgment. My baby was born soon after I moved from the water to a birthing stool. When I have another baby, Suzanne will be my doula again and I wouldn't hesitate to recommend her to any mother.